There is one trend that is going to follow us all year long, from this fall/winter 2016 season until next spring, and it is the military fashion. With military coats being utilitarian jackets par excellence, this trend is often underappreciated among those, who are not that into utilitarian, minimalist looks, as they often find it hard to style it. Channeling a military coat while at the same time remaining true to one’s very own personal style isn’t that hard, and there are actually plenty of different military coats to choose from. Today, we present 10 of the best ways to wear a military coat during this fall/winter 2016 season, from the most sophisticated to the most street wear-inspired ones . For its FW 2016-17 runway collection, Tibi put a strong emphasis on both utilitarianism and military styles, often combining them together. This cropped womens pea coat in virgin wool will just look perfectly fine with both a strong layered and oversized look, which evokes some cool haute couture vibes, or just a casual outfit with a cozy white tee, a pair of cuffed jeans, and sneakers. Ever since Gigi Hadid walked the runway showing off Tommy Hilfiger’s already must-have military coat, everybody instantly knew the American designer hit it big indeed. Made of wool and with a structured silhouette, Tommy Hilfiger’s military coat is just the coolest, and will give you the ultimate dose of glamour to sport all winter long. Free People couldn’t of course refrain from joining the trend with this ultra elegant Sedgwick peacoat in mixed wool. Its extremely classic silhouette and gold accents will give something bon-ton yet extremely contemporary to show off 24/7, from daytime to nighttime. Who says military coats have to be strictly structured and always khaki colored? For this fall/winter 2016 season, Mango decided to mix the classic military coat style, utilizing its signature details, such as the big gold buttons, with princess coat structure and touches of conceptual minimalism, such as the Nehru collar, treating us to one of the most sophisticated fall 2016 military coats we will ever see this season! If the idea of mixing different figures appeals to you, Tommy Hilfiger’s safari-inspired military long coat for women could be the best option for you, especially if you live in a country with a rather mild climate. It features double-breasted button closures, epaulettes and urban-chic belted cuffs, and will look just perfect with any kind of office-ready outfit. That’s true, Tory Burch rarely steps out of her boho-chic comfort zone, but when she does it, she does it spectacularly. 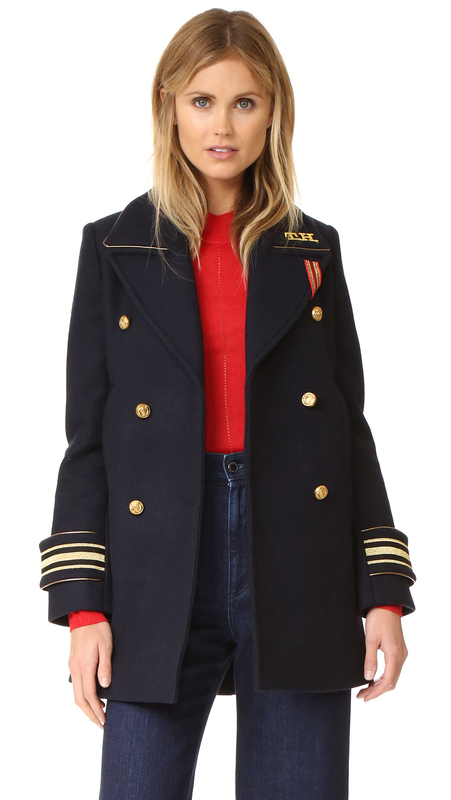 This Tory Burch military coat is everything you need to feel warm, at ease and elegant in, and could be styled with either casual denim pants or more elaborate street-wear proposals. Are you looking for something as cool as affordable? Pull & Bear’s street military style might just be the right option for you, as it combines a refined mixed wool material with edgy patches and clean-cut lines. This military coat is specifically recommended for those who love showing off cool, Nineties-inspired grunge looks! Speaking of affordability, ASOS features plenty of possibilities when it comes to military coats and winter jackets, and this one in particular intrigued us because of its deep cobalt color and contrasting hems, as well as its one-of-a-kind oversized silhouette, which got cropped just below the knees for an elongating effect. Can a military princess coat exude anything but haute couture vibes? This Vivetta military coat in red with black embroideries effortlessly and positively answers this question, as it features the right dose of bon ton and high fashion within a few cuts. Last but not least, here we are with our freshest proposal, which is also the most casual-chic one. This BCX Juniors’ double-breasted military coat will likely appeal to those who are looking for something simple to wear on a daily basis, which could just add the necessary amount of flaw one needs to start the day off on the right foot.